From pretty purple tulips, to pale lavender carnations to dark purple irises – today we’re sharing with you our extensive guide to purple wedding flowers! You’re looking for purple flower names? We’ve got you covered in your search for dark purple flowers, and also have a handy list of light purple flowers for a wedding, too! Purple is an extremely versatile color for weddings – think delicate purple orchids, tulip, larkspur and alliums as perfect purple flowers for a whimsical summer or spring wedding. Or perhaps the deep, dark shades of dianthus, iris and carnations have you picturing a cosy winter wedding? Of course it goes without saying that shades of purple and plum blooms are just perfect for a fall celebration! 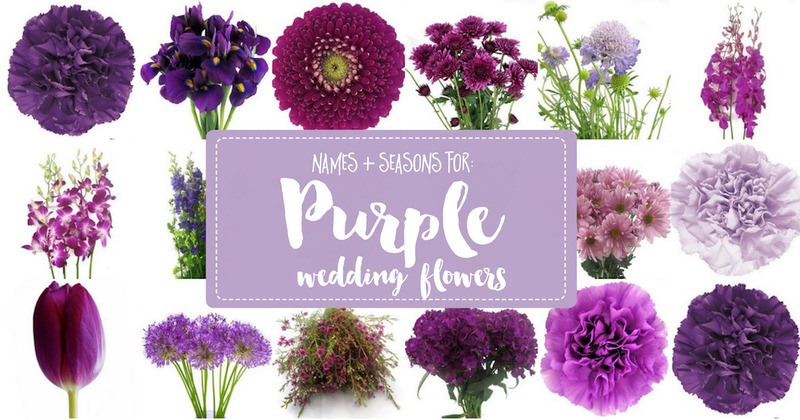 In addition to purple flower names, we’ll be sharing a few hints for how to get the most of your purple wedding flowers, their seasonal availability and flower pairing suggestions. All this, with the help of our friends and sponsors,Blooms by the Box – who sell all of these incredible purple wedding flowers direct from their website online! Check them out here. We love how fun and whimsical purple flowers look in this modern and creative Alice in Wonderland garden wedding. And we’ll always be obsessed with this elegantly romantic ‘tree chapel’ wedding pairing delicate lavender blooms cream roses and pale mint succulents. 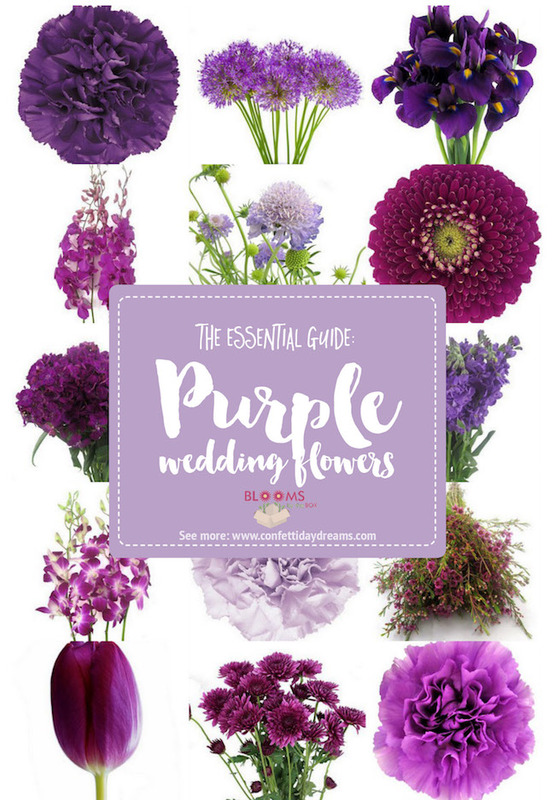 In this fourth installment of our wedding flowers by color series, just think of our wedding flower guide as your handy cheat-sheet to flowers for your purple wedding! Want more wedding flower names and ideas? Learn the types of pink flower names, seasons and pairing info here.